Dropbox offers by far the most popular consumer file synchronization and sharing service on the market; it claims more than 200 million users and over 1 billion files uploaded per day. Dropbox is primarily aimed at individuals who want to synchronize their pictures, documents and other files between their different devices and share them with other people. Many people use Dropbox for business purposes, with or without the knowledge or permission of their employer. 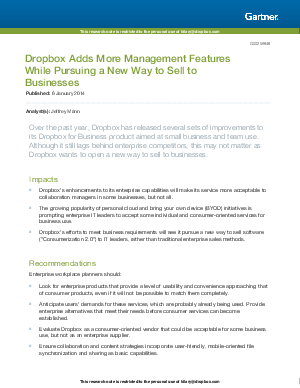 Workplace planners can use this report to help decide how to position Dropbox for — or exclude it from — enterprise use.